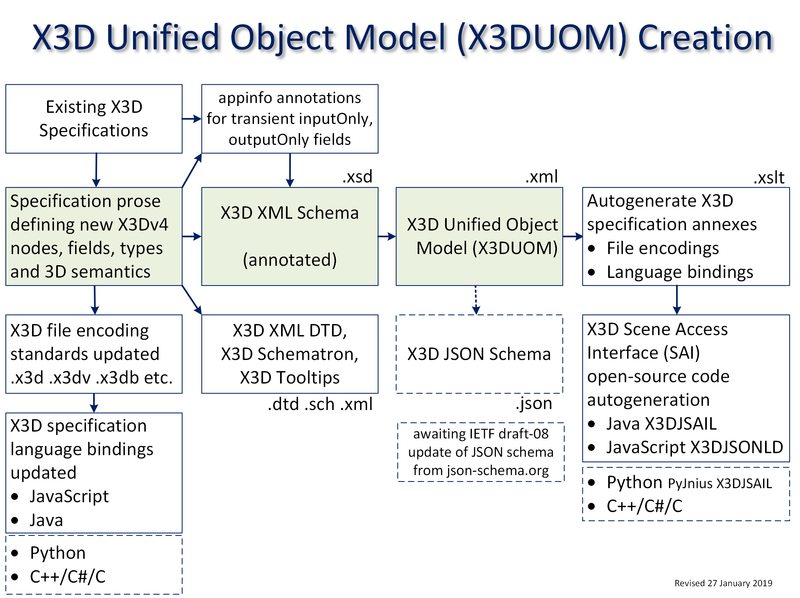 The X3D Unified Object Model (X3DUOM) is a full set of object-oriented interfaces for all nodes, fields and statements in the X3D Architecture Specification. X3DUOM is a validatable expression of X3D relationships that can be applied to implement various X3D file encodings and programming-language bindings. To build the X3DUOM, first the X3D XML Schema is annotated to include all object-oriented information for X3D nodes and fields. All fields are included regardless of accessType (initializeOnly, inputOutput, inputOnly, outputOnly). The schema is then read and converted into a simple XML file that fully lists the object-oriented characteristics of all X3D nodes, statements and attributes. 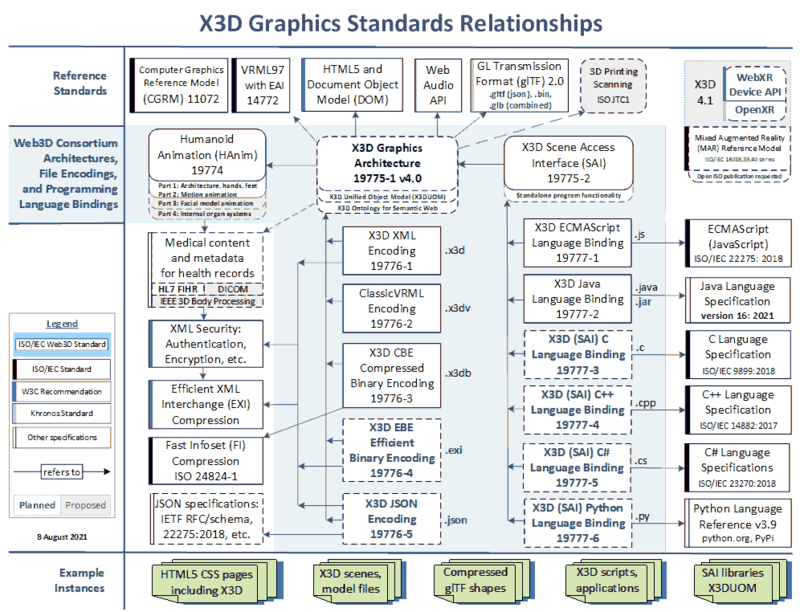 X3D Specification Relationships diagram shows how various X3D file-format and language-binding standards all align together. Each file-format and programming-language standard has equivalent expressive power to the ISO/IEC 19775-1 X3D Architecture abstract reference model and this X3D Unified Object Model (X3DUOM). Diagram X3D Unified Object Model (X3DUOM) Creation illustrates how the X3DUOM build process works. X3D Specifications: Schema and DOCTYPE Validation provide multiple tools for validating X3D files consistently with X3DUOM. X3D Tooltips provide additional detail on content-model parent-child relationships and attribute data typing. Conversions are performed using the BuildX3dUnifiedObjectModelXmlFile.xslt stylesheet. X3D Regular Expressions (regexes) provides documentation for the regexes used in X3DUOM, X3D schemas, X3DJSAIL etc. The availability of X3DUOM as a parsable XML file means that matching codebases in different programming languages can all be created for producing and manipulating valid X3D models. This project was originally named Object Model for X3D (OM4X3D). It has been renamed as X3DUOM to better describe the unified nature of common X3D APIs across multiple programming languages. As described on the Web3D Consortium Recommended Standards page, Extensible 3D (X3D) Graphics provides a coordinated set of steadily evolving ISO standards. Development efforts for each of the following programming-language bindings are providing the full capabilities of the X3D Architecture in language-specific ways. Once complete, this body of work will provide unparalleled breadth and portability for export and utilization of Web-based 3D graphics. X3D Java Scene Access Interface Library (X3DJSAIL) implements the entire X3DUOM. X3DJSAIL ssupports programmers with standards-based X3D Java interfaces and objects, all as open source. Current work has achieved good design patterns and full coverage for source code. Design and implementation of language bindings for C, C++ and C# are being pursued by Myeong Won Lee with early contributions by Roy Walmsley. Draft bindings have been submitted to ISO/IEC by Web3D Consortium as a New Work Item Proposal (NWIP). Current work is focused on achieving good design patterns and full coverage for source code. TODO: draft specification prose for ISO/IEC 19776-6 and submit corresponding NWIP through Web3D to ISO. pythonSAI codebase at https://github.com/coderextreme/pythonSAI which reads X3D files (provided) and generates python files. pythonSAI applies pyjnius to transcode X3DJSAIL source code into Python source code, allowing programmers to access Java classes from Python. Current work is focused on achieving good design patterns and full coverage for Python source code. Discussion regarding X3D Unified Object Model (X3DUOM) takes place on x3d-public at web3D.org mailing list (subscribe). Questions, suggestions, additions and comments about this X3D Unified Object Model (X3DUOM) page are welcome. Please send them to Don Brutzman (brutzman at nps.edu).